Like orange trees, palms rank high on the horticulture list when it comes to plants for which Florida is known. Gracing all of its shorelines, lined up along highway medians, and fanning across the most humble of landscapes, their presence serves as a constant reminder of the Sunshine State’s tropical climes. Not all of Florida’s palms are alike in size and appearance, giving gardeners plenty of options. This variety’s graceful form makes it a good addition for indoor spaces and outdoor landscapes. Its common name is even trademarked. From the short, smooth trunk grows large fronds that gradually arch outward. This palm, native to Madagascar, reaches no higher than 20 feet. Grow it in USDA zones 9-11 in sunny spots or in partial shade provided by other plants. Fertilize it every three months or when its color begins to fade. Water it when the soil becomes dry. Coconut palms are indicative of traditional Florida beach and sunset scenes. Most grow in south Florida, which experiences less drought than northern parts of the state. Several types exist, ranging from dwarfs to those that grow up to 80 feet tall. Smooth gray trunks are topped by several fronds with yellowish-green leaves. They are believed to have originated in the west Pacific and Indian Ocean islands. Its white fruit, protected by a hard woody shell and brown hairy husk, is used in desserts and other dishes. Cultivate coconut palms by planting coconuts on their side in sunny locations and burying them halfway with moist soil. 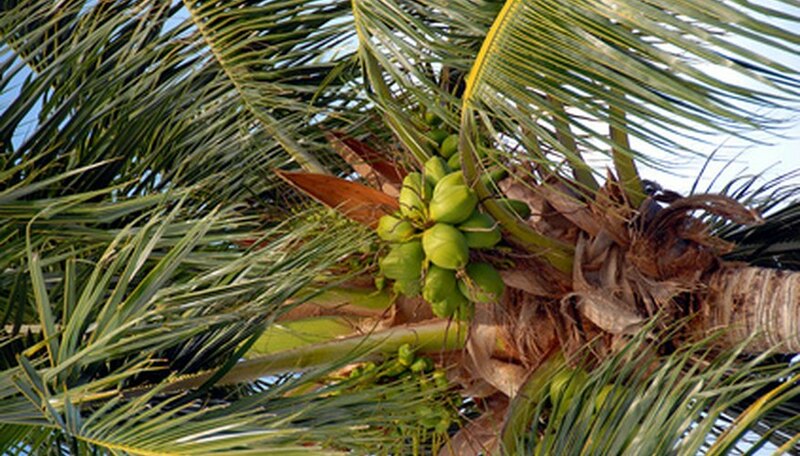 When they mature, beware of falling coconuts, which have caused fatalities. This species is also called hurricane palm for its ability to withstand hurricane-force winds. These palms can grow up to 30 feet tall and sprout leaves that are 3 feet long. On younger trees, the fronds twist and dip downward, giving it an eye-pleasing appearance. Erect spear leaves also sprout from the center, giving the tree an easy identifying characteristic. Yellow or red flowers bloom, and the bullet shaped fruit is purple or black. It is native to the Mascarene Islands, where it is nearly extinct. Grow these palms in USDA zones 10 and 11. Provide full sun and lots of water. Propagate them from seed that germinates in up to four months. Regal in appearance as its name suggests, this palm has a smooth white trunk and leaf clusters that number up to 20 on the top. The species was imported in the 1920s and 1930s, and trees now decorate parkways and boulevards in south Florida. The Royal Palm Visitors Center near Homestead includes several impressive specimens. They are hardy to USDA zones 10 and 11. Grow these palms in places that receive full sun and regularly water them. Plant them as seeds, which are purple and a quarter-inch long.